As we head into the Holiday Season, special guest author Michael Wolfe, CEO of Bottom-Line Analytics, takes a close look at Black Friday retail advertising effectiveness versus everyday advertising. Michael contrasts competitive advertising data from 21 top retailers and reveals the best-performing media channels and KPIs. This is the second part of a prior article studying the effectiveness of Black Friday promotional advertising. In this article, we will expand the horizon of retailers by including a number of mass merchandising retailers that were omitted from the first article. We also will extend the timing of this analysis to include up to and including two days before the Black Friday event of 2017. According to the National Retail Federation, the Black Friday shopping event is really a period beginning Thanksgiving Thursday through the following Cyber Monday. It is the biggest shopping weekend of the year. Overall 69 percent of Americans — an estimated 164 million people, will shop during this time. 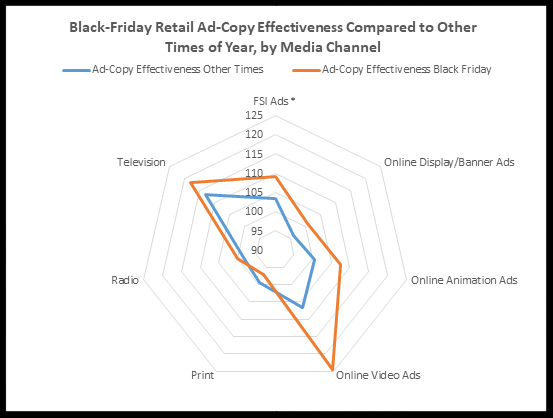 The chart below compares ad-copy effectiveness of Black Friday ads across different media channels. The evidence shows that all media forms, except print and radio advertising, show significantly higher effectiveness than other periods of time on Black Friday campaigns. As shown in our prior study, all-forms of digital-online advertising, plus FSI promotional ads, are the big winners for Black Friday campaigns. Online video ads, in particular, stand out as the top performer. We next turn to understanding how Black Friday advertising engages consumers. 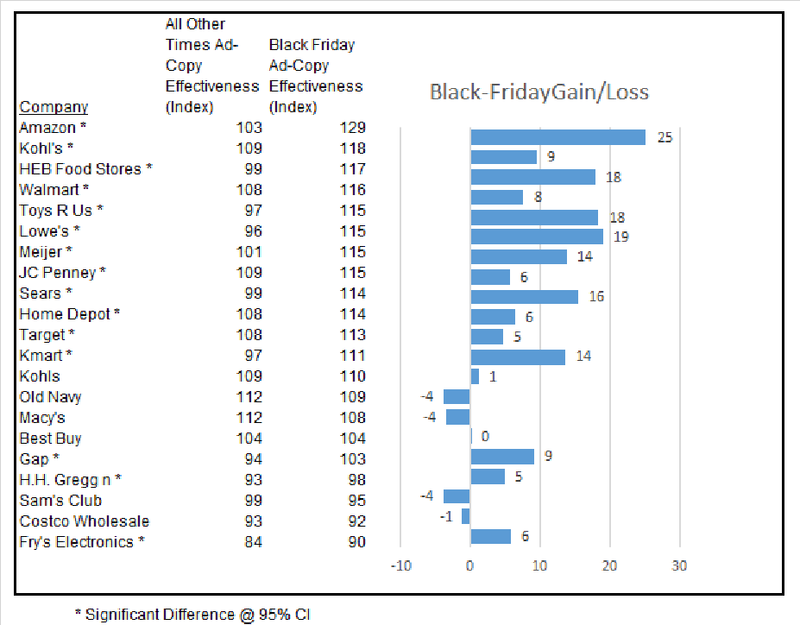 The chart below shows how Black Friday ads perform across various measures of advertising engagement. 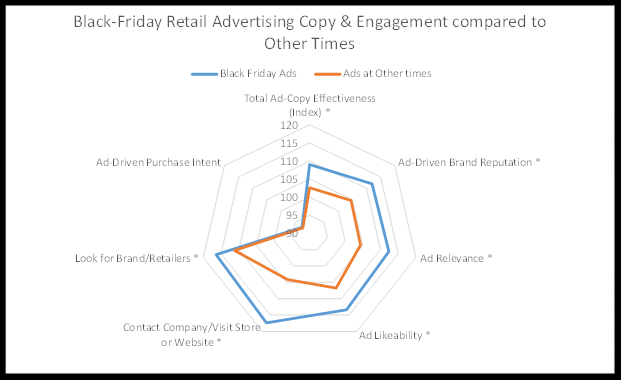 Here, we can now say that Black Friday advertising has significantly higher overall ad-copy effectiveness than other retail advertising at other times of the year. We can likewise say that these ads are also significantly higher in perceived relevance, improved brand reputation, and in ad-likeability. 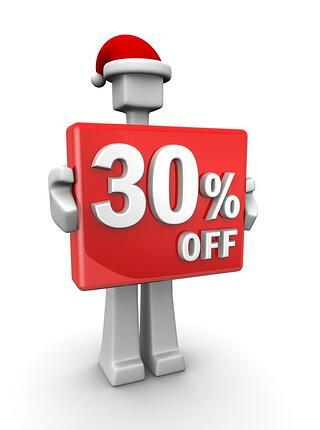 And, those who see Black Friday ads are also significantly more likely to search for the retailer in some fashion, and especially to contact the company, visit their stores or view their websites. Yet, consistent with our prior study, there is no evidence that it drives a higher individual propensity to buy from the retailer. All of this tells us that Black Friday ads are very effective for drawing customers in or driving traffic; but not necessarily more effective in getting individual consumers to buy more stuff. Black-Friday advertising usually starts in October, even though most of it occurs in November. 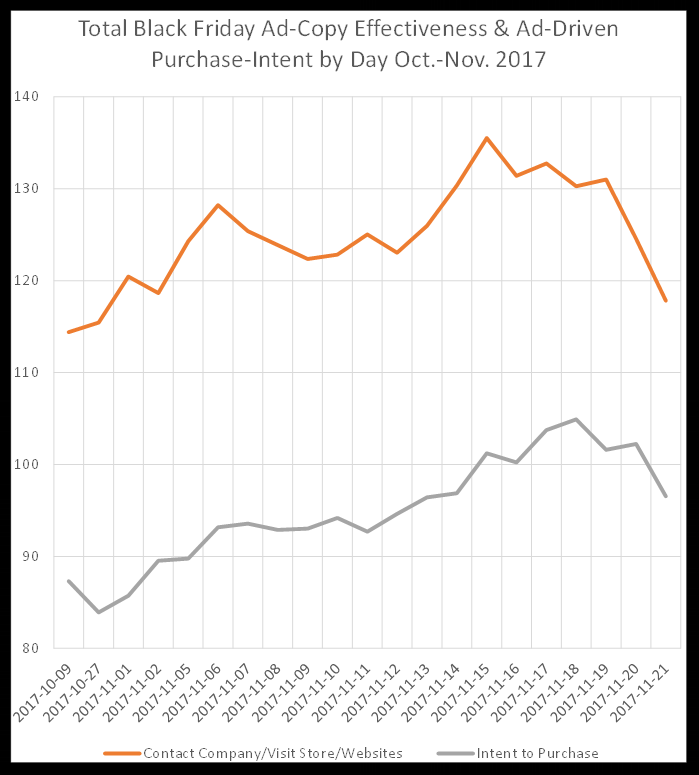 As shown in the chart below, advertising effectiveness grows as the time gets closer to Black Friday and Thanksgiving. Likewise, ads closer to this date also generate more interest and also more positive purchase-intent on the part of consumers. The best and most impactful ads tend to occur just one week before Thanksgiving. In round two of this study of Black-Friday advertising effectiveness, we find that more data gives us a clearer picture of what differentiates ads during this time for retailers versus other times of the year. Obviously, Black-Friday is the busiest shopping period during the year, where consumers are generally presented the lowest prices on a lot of merchandise than they will see across the entire shopping year. We can now say that Black-Friday ads tend to be more effective than ads at other times of the year. These ads drive a lot of traffic and people connect with retailers more than just about any other time. It is a major segue into December holiday shopping. However, there is one thing that Black Friday ads do not do so well and that is to motivate shoppers to buy more. Which means that the gain for retailers is likely coming from the higher traffic than the larger individual transaction sizes. This is both a dilemma and a challenge for retailers. Michael Wolfe, CEO of Bottom-Line Analytics, brings about 30 years of direct experience in marketing analytics both on the client, ad-agency and consulting side. On the former, Michael has worked for Coca-Cola, Kraft Foods, Kellogg’s and Fisher-Price. He has also consulted with such blue-chip firms as AT&T, McDonald’s, Coca-Cola, Hyatt Corp., L’Oreal, FedEx and more recently Starbucks. Michael has broad experience in marketing analytics covering marketing ROI modeling, social media analytics, pricing and brand strategy; and he has numerous articles on these subjects. ABX provides ad effectiveness scores from human respondents against 14 variables and in all media types. ABX Index values are a comparison of the results of an ad versus the average of all ads in the ABX database (100,000+ ads). Click for more information about definitions and methodology.